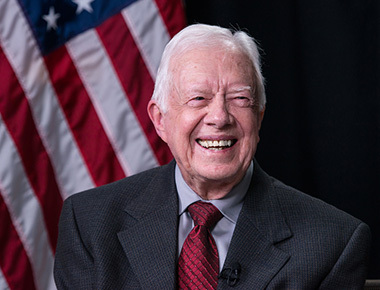 Jimmy Carter (James Earl Carter, Jr.), 39th president of the United States, was born October 1, 1924, in the small farming town of Plains, Georgia, and grew up in the nearby community of Archery. Rosalynn Smith Carter was born in Plains, August 18, 1927. She married Jimmy Carter July 7,1946. Today, Plains remains a small town with about 700 residents. Agriculture is still important to the area with two peanut warehouses and a peanut shelling plant located in town. This southern town remains a special place for President and Mrs. Carter, due to their land, family, and friends. President and Mrs. Carter currently live in Plains in the house they built in 1961. The Plains Georgia Visitors’ Center is located on HWY280 and offers a wealth of local information as well as state-wide material to assist you with your trip through Georgia. They also sell drinks, snacks and local souvenirs. This location has a shaded area with picnic tables plus a large pond,ducks,and geese. The Rosalynn Carter Butterfly Trail also is included at this site and includes a beautiful garden featuring plants that provide nectar and host plants for butterflies common in our area. In the fall, this location is used as a tagging station for the Monarch butterflie as the Monarchs travel through our area migrating to the overwinter sites in Mexico and south Florida. The staff will be happy to assist you with literature about Georgia and can suggest areas around the state you may enjoy visiting. Restrooms and water fountains are also available at this location. The parking lot is large and perfect for RVs and buses. Visitors to Plains may want to visit the three historic places: the Plains High School Museum, the 1888 Depot (1976 Presidential Campaign Headquarters), and the Boyhood Farm. The historic site is open daily, except on Thanksgiving day, Christmas day, and New Year’s day. Plains High School was built in 1921 and closed as a public school in 1979. Both President and Mrs. Carter attended all their public schooling in this building. After a six-year restoration project, the building has been converted into the main visitor center for the Jimmy Carter National Historic Site. The 1976 headquarters for Jimmy Carter’s Presidential Campaign. The farm where Jimmy Carter lived from 1928 until 1941. His father, Earl Carter, later sold this farm in 1949. No fees are charged for visiting the historic site. No food or drinks are sold at the historic site. There are two picnic areas in Plains with tables and restrooms if you would like to bring a picnic lunch. Reese City Park is located beside the Depot Museum, and Plains High School Museum has picnic tables. Plains has 2 restaurants located downtown. If you are interested in making reservations for a catered meal, please call: Buffalo Cafe at 229-824-4520 or The Cafeteria at 229-824-5458. Groups need to make lunch reservations at least one week in advance. Restroom facilities and water fountains are located at Plains High School Museum, the Boyhood Farm, Plains Visitors Center, and Reese Park by the Depot Museum. A bookstore is located at the Plains High School Museum. Souvenirs may also be purchased downtown as well as ice cream, drinks, peanuts, and peanut candies. Plains High School Museum is the National Park’s main visitor center. Once you enter Plains, turn north on North Bond Street and follow the National Park signs to the school. Bus and RV parking is located in the back parking lot. The Jimmy Carter Boyhood Farm, located 3 miles west of Plains, offers limited car parking next to the Carter childhood home with bus, car and RV parking located in a back parking lot next to the comfort station. The Depot is located downtown and has parking next to the building.